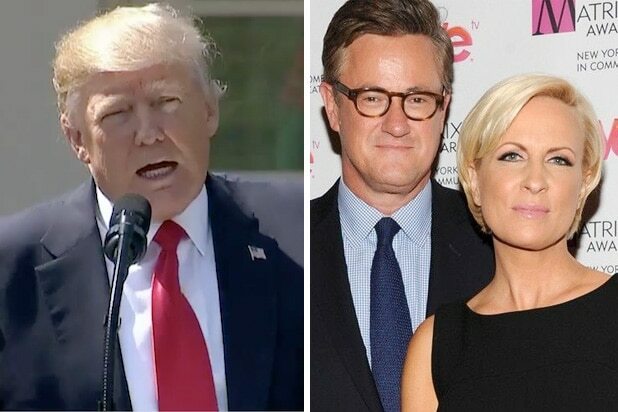 CNN anchor Chris Cuomo unleashed some fresh media-on-media fire Thursday, telling his audience on “New Day” that Sean Hannity’s relationship with Trump now is similar to the one the president once enjoyed with “Morning Joe” hosts Joe Scarborough and Mika Brzezinski. “Remember in the days of the glow, when [Joe] and Mika spoke to Trump all the time, they had him on, discussed what questions to talk about in the break. They were the Trump whisperers,” said Cuomo — speaking of a very well documented period of chumminess between Trump, Joe and Mika around 2015 and early 2016. Cuomo, as he disclosed in the segment, is uniquely situated to comment on the matter as “New Day” is currently up against “Morning Joe” in the morning and he will be heading to prime time for his network to go against Hannity this summer. On hand also during the interview was CNN’s Brian Stelter, who did his best to throw cold water on the comparison.